While archaeologists are all too familiar with dirt, many don’t know much about muck, so it’s time for a trip to the farmyard. I know it’s full of potentially scary animals, smelly, muddy, and you probably forgot your wellies, but it’s one of the best places to look at, and think about, built environments. Traditionally, even modest domestic houses were usually part of their own built environment, with outside toilets, fuels stores, wash houses, kennels, sheds, stables, and other outbuildings that grade imperceptibly into genuine farm buildings. Even today, those people who still live in a house, on a piece of land, may have vital outbuildings such as garages, workshops, and garden sheds, which though small, are of immense significance - particularly to the ritual life of the male. In the British Isles, a secure well-constructed built environment is an essential requirement of any mixed agricultural system. It is essential, as archaeologists studying agrarian economies, to think about the relationship between building and agriculture. It is important to think about buildings and structures as part of a group with individual, but interrelated, uses and functions. Farmyards illustrate the close relationship between architectural form and building function and the importance of ergonomics in efficient buildings. Farm buildings also usually have often a multifunctional role and adaptable elements and, in a contemporary context, illustrate change of use. The importance of orientation and aspect are highlighted in the layout of buildings. A practiced eye can read a set of farm buildings, each building, in its utility and capacity, intimately reflecting some aspect of the farm’s economy. Thus, if you want to understand an agricultural economy, and the wider society it supports, look at its buildings. However, since the raison d’etre of theoretical structural archaeology is our failure to interpret much the prehistoric built environment, we are going to look at a farmyard a lot closer to home. 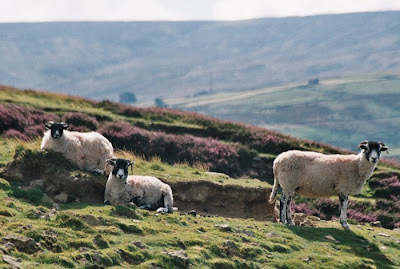 There is no such thing as a typical farm, and I could have chosen a variety of different regional types and layouts, but I live on a hill farm in the Pennine Hills of northern England. We are going to look at just such a farm, built around 1800, using the a model created by R.W. Brunskill. It is a family farm, sized for a pre-mechanised age, of about 150 acres / 60 hectares, a small proportion of which would be arable. 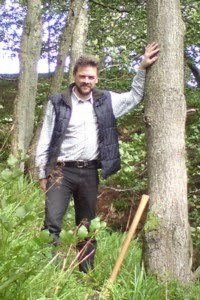 For convenience, we shall refer to our farm as Brunskill Farm, in honour of Professor Brunskill, a scholar who has probably done more than anyone to promote the study and conservation of the rural built environment. 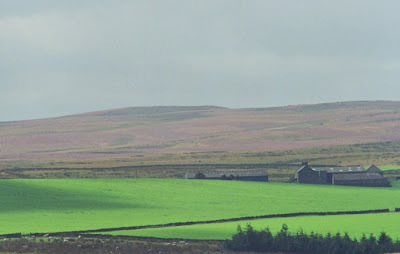 Brunskill Farm is a group of specialists gathered round a yard or fold. This faces south, with the larger buildings concentrating on the north and west sides, protecting it from the prevailing winds. We will go through each of the elements in turn. The farmhouse faces east and away from the yard, with its back to the wind. The north- and west-facing sides of the farmhouse may have fewer and smaller windows, and the rooms at the back of the house will be colder, and more likely associated with food storage and preparation, as well as other activities associated with the farm. The fold yard is in many ways the main outdoor working space of the farm and the centre of its network of fields, lanes and gates. As a structure, it faces south and is bounded by walls and buildings, which shelter it from the prevailing winds. 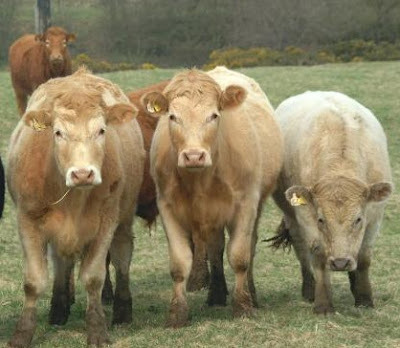 Its principle use was as an enclosure for cattle, particularly younger animals during the winter, when the grazing becomes exhausted and fields can become very wet and muddy. Thus over-wintering stock would be brought into the fold yard to be fed, and to shelter them from the worst of the winter weather. The shelter shed is covered space open to the fold yard where cattle shelter and can be conveniently fed, away from the elements. Control of the feeding environment cuts down wastage rate, and helps ensure an equitable distribution of fodder. The loft space over the shelter shed can be used to store feed and bedding. The midden at the centre of the yard is the principle source of fertiliser, in the form of manure. 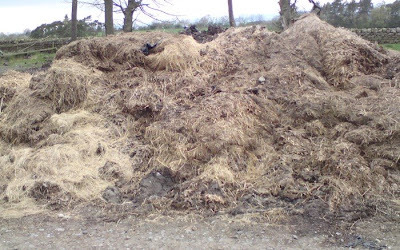 It is produced from rotting down the mix of animal dung and straw bedding derived from the daily cleaning of the animal accommodation. While moisture is important to the rotting process, too much will impede the rotting process, wash out vital salts and minerals, and make the manure heavy and difficult to handle. So protection from the elements may even be a consideration with to the midden. The barn is a building with a very specific function and form, associated with the processing of cereals, principally wheat, but also barley, oats or rye. Processing refers mainly to threshing, but also to winnowing, a time-consuming process carried on in the autumn and winter after harvest. The centre of a barn is the working area or threshing floor, with bays on either side to store the sheaves and the separated straw. There is access to unload the cart bringing the sheaves from the stooks or stacks where they have been stored while drying. The barn provides a controlled environment for threshing (mechanically beating the stems to detach the grain), traditionally using a flail, which requires an open area of area of floor and unobstructed headroom. Threshing is followed by winnowing, where the wind - the through draught of the 2 barn doors -- is used to separate the lighter chaff from the heavier grain. This process is in essence tossing grain in a basket and letting the wind blow the chaff away, but, as with threshing, it is a question of scale: farm grain output is measured in tonnes of grain. 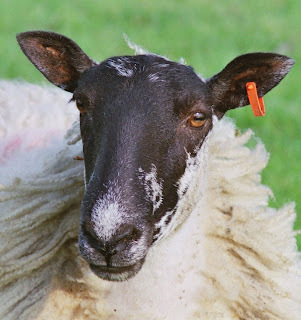 Barns are a useful enclosed space, technically not required during spring and summer, which could be used for a variety of other functions, such as sheep shearing. 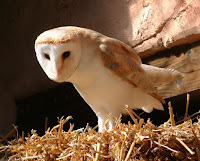 One aspect of historical barns is the inclusion of ‘owl’ holes to allow access for barn owls (right), which were encouraged to live in the barn for help in pest control. The granary is a specialised building to store grain. It is normally raised to protect grain from vermin and damp, and usually well ventilated to aid drying and discourage mould. On Brunskill Farm, the granary is over the cart and shelter sheds. Positioning the granary over the tall, open-fronted structure of the cart shed is a common option, providing security and ventilation to the floor. Positioning over the stable, or as part of the house, are also known from historical contexts. Security is a key consideration for a granary, not just a good standard of weatherproofing and building quality, but also a strong door and bins and chests for storage, loose grain being harder to steal than grain stored in sacks. The cow house is commonly known as a cowshed, and regionally, byre (north), shippon (Lancs), or mistal (Yorkshire). 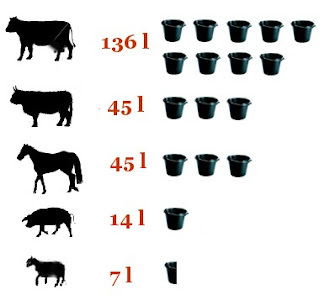 Cattle are kept for meat, dairy produce, draught power, and as a useful source of manure. As a valuable portable asset, as with grain, they may require housing for protection. Cattle may be accommodated loose in a building, but tethering or placing them in stalls makes them easier to feed and muck out, these two processes both being part of the daily routine of keeping animals in a building. The feed, hay, straw, and muck pile should be close at hand. Access to the manger or hayrack at the front of the animal is required, as is access to the rear to remove muck and replenish the bedding. The cow house at Brunskill Farm has 2 rows of stalls with a central feeding passage and two further passages for mucking out, each with its own door. Stalls have to be large enough to allow access to replenish bedding, feed and water, and to allow the animal to lie down. Lofts storing bedding and hay help insulate the cow house, which traditionally has a low ceiling and few windows, thus retaining the animals' heat. 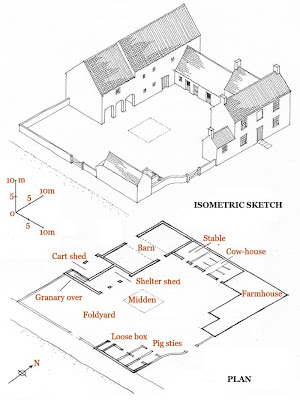 Cow houses were warm places, and in some configurations of farm buildings, domestic accommodation would be situated above. As with all buildings associated with the keeping of stock, the floor surface has to hard enough to allow it to be mucked out, but suitable for animals to be bedded on. The floor of the cow house and similar buildings should slope sufficiently to allow drainage of liquid waste from the building. The stable is used to house working horses, especially in poor weather. In common with other buildings, hay and bedding may in stored in a hayloft in the roof space. The value of horses has led to stables being characterised as having strong doors. They tend to be more open and well ventilated than the cow house, and may require space for harness and tack. The pigsties at Brunkskill Farm are a low roofed building, large enough for one or two animals, with a larger pen defined by a robust wall, with a trough for feeding. Pigsties usually occur in multiple units, and would be used to house pigs when farrowing and in the winter months. Pigs are an important component of the traditional mixed farm that can eat all manner of foodstuff often unsuitable for other animals, and the ability to scavenge, and subsist in woodland on acorns and other mast, was an important part of their value. Loose boxes provide a flexible space for animals of various kinds that need to be sheltered or separated, perhaps for reason of sickness. On Brunkskill Farm, the chickens were accommodated over the pigsties, and there would also be suitable provision for firewood, coal, timber and a range of specialist tools and equipment. Farming on Brunskill Farm was hard work, and no opportunity would be missed to make the work easier and more efficient, but the bedrock of the system was the ergonomics of its built environment. Building creates the specific spaces required with the resources available; you don’t have to invent spaces - cart sheds are an architectural response to the invention of carts. Traditionally, and in a preindiustrial economy, control of land and its production was the principle source of wealth. However, agricultural land of itself is of little value without the infrastructure to make it productive. The farmyard is the essential hub of a built environment that in a sense also includes fences, ditches, gates and lanes, which facilitate the land’s productivity. Furthermore, the agricultural built environment protects the portable wealth represented by the livestock and produce of the farm. By the time Brunkskill Farm was built, around 1800, a good strong door and bolt was about the limit of security required to protect the farm's assets from predators, but in the previous centuries, a farm would look more like a small castle, such was the threat from predation from neighbouring human beings. 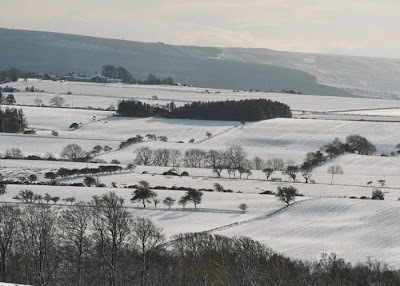 The North Pennines had always been too close to the Scottish border, an area where the traditional means of wealth creation was to take someone else’s. 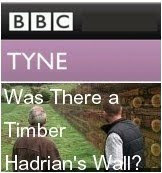 In the next article we will look at the dire state of Scotland in the Seventeenth Century, and consider how this affected the built environment. 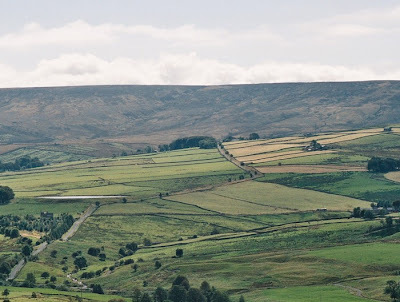 The north Pennines sure looks beautiful. The development of the homestead is indeed for the convenience and protection of the family and its assets. In prehistoric and historic societies we even find the family grave yard under and even in the family home until it is shifted to the courtyard of the home as the domestication of larger animals occurs the courtyard grows to a walled field and the cemetery leaves the home itself. Though in some societies this happened later such as in Ptolemaic Egypt where the practice appears to have died out. This practice of keeping the dead in the home appears often in societies where the household can provide mummification. Even in recent times the family graveyard was maintained on the family farm though its influence on the development of the homestead became diminished with the domestication of livestock. The animals have trained us well! I wonder if burials on site tend to imply a certain degree of ownership, or at least security of tender. I have found roman baby burials in courtyards, probably stillborn, ( but possibly female infanticide!). Family burials are probably determined by the nature of the relationship within the family. 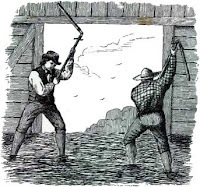 I would expect that adversarial members of the unit may be buried farther away from the homestead than loved ones particularly in superstitious societies, this might include victims of infanticide. The burial of babies in particular are often found buried directly under the floor of the home, under the kitchen floor or even under the bed. Flinders Petrie found a number of babies buried in this manner in the middle kingdom homes of the town of Kahun. These babies probably represent both tender and the feeling as a parent of being helpless to have done anything except to keep the babies body close to them so that they could be assured no further harm came to the infant. One wonders if the two still born babies found in King Tutankhamun's tomb may have been kept in the palace until they could be placed with a parent to protect them in the far away tomb in The valley of Kings. Stillborn children are clearly treated differently in many societies, in traditional Christian societies they could not be buried in consecrated ground, I don’t know how ancient this tradition is, but the practice helped reinforces the medieval churches absolute role in determining the nature of your afterlife. For the Iron Age we are rather short of burial evidence, which is fine by me, too much energy is spent worrying about how people died, a single brief event in their lives, and not enough trying to understand how they lived. I don't know why people hate farm animals I remember when I live in my grandparent's house we used to milk everyday and also we cleaned the stables so people think that it could be disgusting but to me it was fabulous. These structures always prove helpful for the builders. I have experienced it many times and learned from these structures.